The Comic-Con news just keeps on comin'! Jakks Pacific has announced that they are producing Mega Man 11 toys. A 3-pack set featuring figures based on Mega Man, Block Man, and Block Dropper will be sold exclusively at GameStop later this year. More news on this front soon. Head to Nintendo Wire for more Jakks Pacific announcements! Gotta get that cash before the 4 inch nel comes. The robot masters however I support. Keep making them. Nice, would definitely get that Block Man. They look presentable. I'll put this in the maybe column. 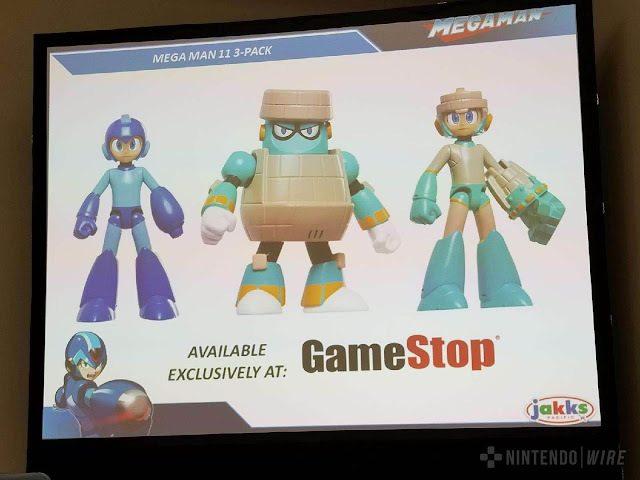 The Megaman's themselves don't look too great but I wouldn't mind having the Blockman figure. they're probably going to make others mm11 robot masters. i hope so, i would like a torchman figure.